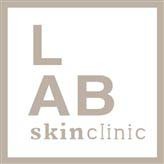 Blackheads at LAB Skin Clinic, Neutral Bay – Call 02 9909 3602. Blackheads are a pesky problem that require careful management and the correct skincare and treatment protocols for your skin type. Blackheads, whiteheads, congested pores, dull complexion, and uneven skin are signs of clogged skin and can appear in young people and adults. Blackheads (open comedones) are small plugs that seal the pores (hair follicles) that have been partially blocked by sebum (oil), keratin (shed dead skin cells) and bacteria. A comedone can be open (called a blackhead) or closed by skin (called a whitehead, or milium). Being open to the air causes oxidization, which turns it black. Blackheads appear with or without acne. Whiteheads stay under the skin surface and covered by debris, so they remain lighter in colour. 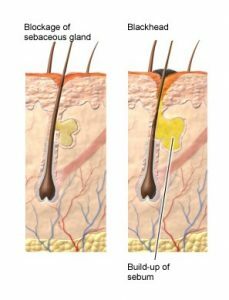 Blackheads form when a clog or plug develops in the opening of hair follicles in your skin. Each follicle contains one hair and a sebaceous gland that produces oil. This oil, called sebum, helps keep your skin soft. Dead skin cells and oils collect in the opening to the skin follicle, producing a bump called a comedones. 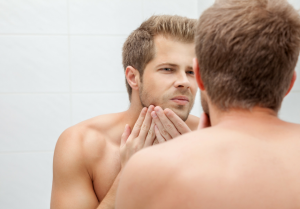 Congested or clogged skin is skin with large pores and blackheads. Skin appears thick and dull in appearance. You may think dirt is the culprit for clogged pores, since blackheads are dark in colour making them look like dirt is stuck in the pore, however, as the glands expel dead skin cells, build-up can occur, and your pores will clog. The gland will continue to produce oil with no way to release the excess. The result is an infection called a pimple or blackhead. There are various issues that can cause pores to appear larger: oil, dirt, pollution, and dead skin cells can clog them and expand their diameter (and once the gunk has oxidized and darkened, create blackheads); and while they’re generally most noticeable on congestion-prone oily skin, they can also flatten out and look bigger. Blackheads often take a long time to clear and it may be tempting to squeeze to clear them faster, but squeezing blackheads is a bad idea and not the correct way to remove them. A blackhead contains oil that is too tightly stuck in the pore and if you try you squeeze you will cause trauma to the skin around the blackhead leaving it red and irritated. When you squeeze a blackhead, it moves the bacteria deeper into the skin pore, which can cause the blackhead to become more noticeable, painful or infected. More importantly, squeezing a blackhead can lead to permanent scarring. Professional treatments: We never remove your pustules (pimples), blackheads or milia because the skin is fragile and will easily scar; instead the skin should be treated professionally. We treat the inflammation, gradually eradicate existing blackheads and destroy the bacteria with Omnilux red and blue LED lights in conjunction with specialized topical solutions and sometimes exfoliation, peels, microdermabrasion, laser, skin needling, and facial lymphatic drainage. Your skin care professional will advise the best treatment protocol for your skin condition. Call in for a complimentary consultation, call us on 02 9909 3602 or click on the link below to make your appointment. For long-term control it is essential to seek professional help to find the real cause of your acne however, with a good basic cleansing of your skin and a few lifestyle adjustments, you can make a huge improvement. Do not use rubbing alcohol – it throws the hydrolipidic skin layer off balance. When acne is caused by stress, you may find that yoga, massage and relaxation techniques can help control the problem. Take daily Vitamin B complex and zinc supplements if you have acne that is caused by hormonal imbalance – these substances normalize dehydrotestosterone and cortisol (two hormones secreted by the adrenal glands – some genetically predisposed people have hyperactive adrenal glands). Oil and sebum – are being constantly produced and, when combined with other factors, cause clogged pores and stimulate the growth of bacteria. When combined with other factors like dirt, pollution, poor product choices, or poor skin hygiene, black spots form easily. Accumulated toxins: Skin cells are supplied with nutrients by the blood and lymphatic fluid, they also transport toxic material to the skin for elimination through sweat. However, if toxins accumulate, through poor diet, they may contribute to congestion and other problems such as skin irritations and acne. Dead skin cells: your skin cells regenerate constantly. This is a natural process and the outermost layer of skin is essentially dead. If not removed regularly, your skin won’t appear healthy and radiant. In addition, these dead cells can clog pores on your face and cause congestion or blackheads. People with excessive sebum production will experience blackheads and whiteheads more frequently. Skin care and make-up products: One of the main reasons for congested skin is poor product choices. Over-the-counter skincare products often contain alcohol and oil-based petrochemicals, which can dry your skin and prevent it from breathing properly; talcum powder (often used in finishing powders) tends to behave similarly. Waxes and creams can also be a problem to those with congested skin. As these products are usually used daily, it’s important to use professionally prescribed products suited to your skin type that won’t congest or cause imbalance on the skin. Pollution and waste: A layer of chemicals from pollution builds up on your skin during the day, it plays a significant role in causing clogged pores and the formation of blackheads. The more polluted the environment, the more likely it is you will experience skin contamination. Effective cleansing of the skin is essential to removing grime and dirt. And just a trickle of water won’t be enough… The dirt that has accumulated on your face and other body parts, is a perfect breeding ground for microorganisms and when combined with oil, it becomes worse. Poor hygiene: dirty hands and insufficient face washing are frequently the main culprit of congested skin as you may regularly touch your skin unintentionally, which simply exacerbates the problem. 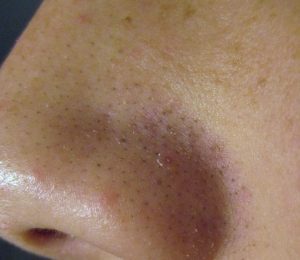 As we have said before, there are better ways to treat blackheads than squeezing them, however tempting… You should deal with the actual cause directly. Proper cleansing routine:It is essential to remove dirt and traces of pollution every day. Use a mild cleansing gel and do not use drying or harsh cleansers, which exacerbate the problem by stimulating and increase in oil production. If your skin is tight and dry after washing, things can get worse. Avoid products that contain sodium lauryl sulfate, as it can increase the skin pH level and will increase oil production. Use an oil-free cleansing gel about twice a day to wash your face. Don’t use soap, as it can dry your skin and lead to increased sebum production. Use a medicated gel containing at least two percent salicylic acid. Gels will salicylic acid help to absorb excess oils and remove dead skin cells that can clog pores. After cleansing, Apply a good toner with the active ingredient of salicylic acid over your skin after cleansing. This helps to remove excess oils and cleanser residue and helps reduce and prevent acne. Toner also helps to tighten the skin and reduce the size and appearance of your pores. NOTE: If the pores on your nose, cheeks, or forehead are large, avoid drying masks, cleansers, moisturisers, toners. Gentle exfoliation:The regular use of facial exfoliants is very effective in removing the dead skin cells that clog your pores. To reduce clogged and congested pores, the top layer of your skin should remain clear of dead skin cells. Use a combination of enzymatic and physical exfoliation two to three times per week to remove these dead cells, making way for new, healthier ones to come to the surface, not only leaving a fresh, smooth and younger looking complexion, but also allowing for serums, gels and moisturisers to penetrate and work more effectively. There are two types of exfoliants – physical and chemical. Both are instrumental in the fight against many skin conditions including ageing and acne, and it’s important for you to know the difference to avoid injuring your skin. Physical exfoliants, also known as scrubs or manual exfoliants, remove the dead skin cells through friction. A facial scrub contains micro exfoliating beads that slough off the dead cells on the surface as you manually rub it into your skin. Physical exfoliants are ideal for dry and flaky skin and beneficial for those with excessively oily skin. The tiny granules will clean out pores and remove dirt, makeup and other debris, preventing them from clogging the pores further. This should be incorporated into your skincare regime once or twice every week, reserving chemical exfoliation for more intermittent use. Chemical exfoliants remove dead skin cells by dissolving the glue-like substance that binds them together. Most chemical exfoliant products use salicylic acid, alpha hydroxyl acid (AHA), beta hydroxyl acids (BHA) or retinol. Unlike physical exfoliants, chemical exfoliants are simply applied to the skin and then rinsed off—no scrubbing is required. This makes chemical exfoliants especially beneficial for dry, sensitive, acne-prone and ageing skin. A chemical exfoliant can come in the form of an everyday cleanser, or for a deeper exfoliation, a masque or peel. If you have sensitive skin, we recommend natural plant derived enzymes. When it comes to exfoliation, the goal should be to use a product that allows you to exfoliate as much as possible with minimal irritation to achieve the smooth, healthy and radiant skin every client desires. Light moisturizers:All too often, the hardest conversation with new clients revolves around the use, or lack thereof, of a moisturizer. Many new acne and oily prone clients have an innate mistrust of using non-medicated “creams” for fear it will lead to future or prolonged breakouts. The result is dehydrated skin, which is highly prevalent amongst those with oily or acne prone skin, especially if they have been using harsh over-the-counter products that usually contain alcohol, which strips the skin of moisture and impairs the barrier function. In addition, prescriptive medications such as isotretinoin further exacerbate the dehydration issue, sometime to the extreme. For congested skin, there is a need to add moisture, but not oil. If an oily skin is dehydrated, the skin will produce MORE oil to make up for the missing moisture, potentially leading to more breakouts. Oil-free is the key, and hyaluronic acid is one of the best ingredients on the market to quickly, effectively and non-aggressively hydrate the skin. The use of Squalane in a moisturizer restores skin suppleness while also helping to prevent future moisture loss. Mild Vitamin B5 derivatives, such as Panthenyl Triacetate will assist in soothing and restoring irritated skin. Moisturizers that contain waxes, oils, creams and petrochemicals make congestion more likely and they certainly contribute to the formation of blackheads. Creams are certainly useful for dehydrated or dry skin, but for congested skin, a lighter lotion should be used instead of a heavier cream. For people with congested combination skin and dry skin on certain areas, they should use hyaluronic acid and an oil-based serum to increase the skin moisture without causing new problems. Glycolic acid and salicylic acid:At high concentrations, these chemicals work well for congested skin, in short-term; they may cause serious problems and can reverse your effort in trying to remove blackheads because they make skin drier. Additionally, people who use high concentration of glycolic acid often may experience irritation and redness when they are exposed to slightly acidic substances such as ascorbic acid or even lime juice. If you want to use these products, try to discuss it with your skincare professional. Initially, start with low concentration at short-term and observe for signs of dry skin. Mineral make-up:It is a good option for people with congested skin. Instead of filling in or falling on the pores, the pigment particles sit on the skin surface, which allow the skin to breathe well. It reduces congestion and finally allows pores on our skin to contract. Lifestyle and dietary habits:A diet rich in vegetables, fruits, lean protein, healthy fats, nuts and seeds is good for our skin because it contains many vitamins, antioxidants and minerals that promote a healthier skin. Drinking a lot of water can also help to remove toxins from your system and regular exercises will allow smoother lymphatic flow. Together, these two factors will contribute to lower level of toxins. Research at a university in Melbourne, has shown that a low-GI (glycaemic index) and moderate-protein diet improves acne symptoms. Your diet should consist of 45% energy from carbohydrates and 25% energy from protein. This research has been conducted in patients with acne and it was shown that there is a strong correlation between a high GI diet and skin congestion. In general, a high-GI diet may cause a relatively higher level of toxicity and systemic inflammation, as the result it may make you more susceptible to skin diseases associated with toxins excretion. Starting a regular seasonal detoxification routine can brighten skin and reduce acne and redness. Fruit enzymes are especially effective for gently removing dead skin cells; they accelerate cellular regeneration and contain a gentle enzyme, called protease, that unglues the dead skin cells and tightens pores while giving additional nutrition to the skin This leads to greater skin flexibility and reduces the formation of excessive dry flakes on the skin surface. Fruits enzyme should be used about twice a week. Call in for a complimentary consultation, call us on 02 9909 3602, or click on the link below to make your appointment.